For a company which business depends on collecting data, Google sure was slow tabulating its report on smartphone usage. The study is available today, but the data is already outdated given strong holiday e-book reader and tablet sales and global impact of 37 million iPhones sold during fourth quarter -- the startling number Apple released yesterday. Still there are some fascinating trends here that likely will prove true had Google collected data in December or January rather than September-October. What I find perplexing: 17 percent of US smartphone owners also have tablets -- 11 percent in Japan, 10 percent in United Kingdom and 8 percent each in France and Germany. Note: This data, as the rest, is for smartphones privately used. 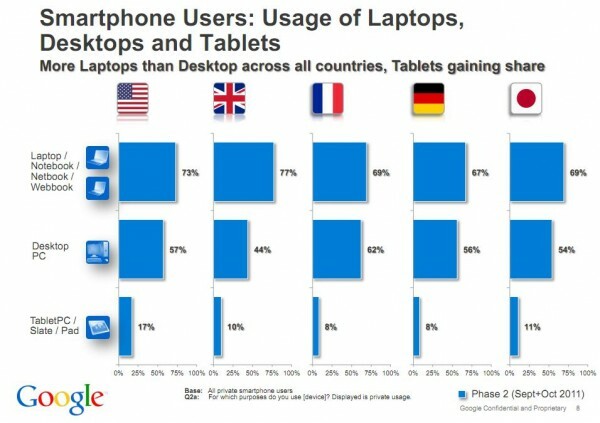 The percentages likely would be higher when including business use, and the trend is accelerating, says Google. My question, and this is really for you to answer: Why buy a tablet if you have a smartphone? Remember, Google isn't tracking PC owners who buy a tablet, but smartphones users who do. A tablet's functionally lies somewhere between a smartphone and small laptop, and much of it overlaps. Then there is cost to consider. Let's be honest. Apple's iPad is the overwhelming market leader, so we're really talking smartphone and iPad. That puts the starting price at $499 for WiFi-only and $629 when adding 3G (iPad doesn't pack a 4G LTE radio). Why pay for 3G twice on phone and tablet? There's sense to replacing or displacing a laptop for tablet, and this is a well-documented trend. The most startling recent report, from IDG Connect, shows the trend accelerating among business and IT decision makers -- it's no longer a consumer phenomenon. Sixteen percent have replaced their laptop with an iPad and 54 percent supplement it. Using myself as example, in December I bought Motorola XOOM LTE from Verizon; yes, I'm a smartphone owner. I bought the tablet not to replace the smartphone but my laptop on the go. Over Black Friday weekend, Verizon offered XOOM for $199.99, a shocking price for a 10.1-inch dual-core tablet with 32GB storage and LTE. Now I take XOOM on to go, when I need a bigger screen to work or play but don't want to lug around the laptop, which doesn't have LTE radio. Even then, only the tablet's low price justified taking on the second data plan. XOOM in no way replaces or displaces my smartphone. That's the no-relationship theory. The tablet buyer happens to own a smartphone and PC and is buying the tablet to supplement the computer. So the smartphone is then incidental to the tablet. Another reason to consider: Perhaps the smartphone isn't good enough. That's a point colleague Mark Wilson makes today in his mini-review of Kingsoft Office 4.3 -- there's inadequate screen space on a smartphone but room enough on a tablet. This could be particularly true for iPhone, with its 3.5-inch screen. So people wanting a portable connected device buy an iPad, too. Here's another: iOS envy. Jack or Jane consumer has an Android device and contractual commitment but wants iOS. Buy iPad, increase screen real estate, get access to different apps and join the Apple Fanclub. Nineteen percent of Americans owned a tablet at the end of December, according to Pew Internet. Google's smartphone data is nowhere near as fresh, but still trend worthy. The search and information giant compared data sets from January-February and September-October. Smartphone ownership in the United Kingdom soared from 30 percent to 45 percent -- 31 percent to 38 percent in the United States. By the way, Nielsen says that at the end of December, 46 percent of Americans had smartphones. Wrapping up, do you own a smartphone and tablet for personal use? Why?